Moving into a new country or territory can be a huge challenge no matter which industry you’re in. But, for healthcare tech innovators that have pioneered solutions designed to solve the challenges faced in their domestic markets, branching out into the wider world can be extremely daunting. The key is finding a region or market that’s both similar enough to your domestic market for you to transition into easily and different enough to offer you exciting new opportunities. For healthtech companies based in Nordic countries, Cornwall is increasingly looking like a great place to naturally branch out into the UK and beyond. Cornwall has a very similar demographic and geographic setup to the Nordics. Both are characterised by small, ageing, rural populations, interspersed with small-to-medium sized urban areas. As a result, many of the healthcare technology solutions developed to best serve Nordic countries are also hugely appealing to healthcare providers in Cornwall. Because their populations and challenges are so similar, both regions have extremely similar goals that they’re trying to achieve through the use of innovative new healthcare technologies. From effectively delivering care to those in isolated locations, to enabling patients to remain independent in their own homes for longer, the broad goals of both regions are far more similar than you might expect. In Cornwall, the ageing population – paired with a significant influx of 35-55 year old professionals in recent years – has turned the region into a snapshot of future Britain. By tackling the challenges faced by healthcare providers in Cornwall today, healthtech companies will naturally build solutions that are future-ready, when demographics across the UK shift in line with what’s already happening here. The UK has been an attractive market for health technology businesses for decades, and NHS buy-in of a new solution has become something of a ‘seal of approval’ within the industry. Getting a new solution into the NHS can prove hugely valuable, as once one trust has adopted a tool, there’s a clear use case for it to be deployed in others – but, securing that all important first deal can be extremely challenging. When looking at accessing the NHS in London for example, things are far from streamlined. Businesses have to navigate their way through 32 Clinical Commissioning Groups, over 30 acute care trusts and over 30 local authorities – some with cross border responsibilities. For health tech companies using London as an entry point to the NHS, that’s obviously problematic. In Cornwall however, there’s just one acute care trust (Royal Cornwall Hospitals Trust), one Clinical Commissioning Group and one local authority – making it comparatively easy to access the right influencers and decision makers. Even when there’s just one trust and commissioning group to deal with, it can still be challenging to make your first deal and start working with the NHS. And if you’re new to a region and have no existing connections with relevant healthcare figures, it can feel next to impossible to get your foot in the door. Cornwall Trade and Investment can point you towards the right people and arrange meetings with the right decision-makers and influencers within the region. By helping you make the right connections from the moment you consider moving to Cornwall, we’ll do all we can to help you utilise the region as a launchpad for accessing the rest of the UK market and Europe. Innovation is in Cornwall’s DNA. With a growing technology community, there’s a huge hunger in the region to find new ways of using exciting tech to cut costs, increase efficiencies and ultimately, improve lives. The unique blend of education institutions across the region is fuelling a rapidly-expanding tech ecosystem – one that is making it easier than ever for healthcare innovators to find relevant skills, collaborate with peers and share ideas with companies that share their goals. And that hasn’t happened by accident. There has been a very deliberate push across the region to develop and nurture the kinds of digital skills that healthtech companies need to innovate and succeed. 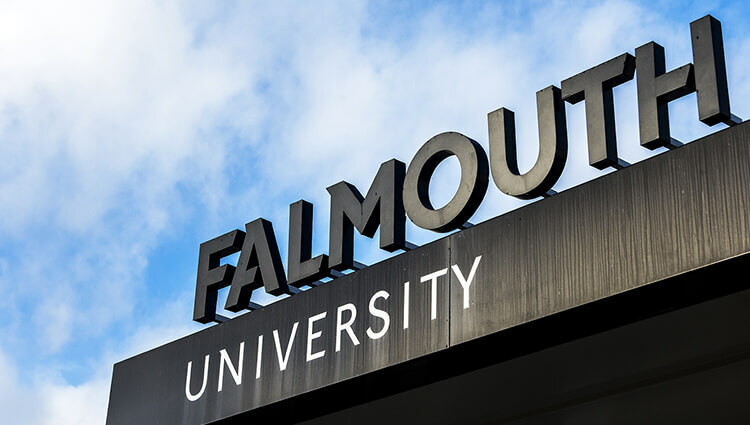 With the University of Exeter specialising in health, medicine and science, the University of Plymouth making major steps forward in robotics, and Falmouth University nurturing creative and digital skills to bring everything together, there’s a powerful blend of skills emerging in the region. The EPIC project operated by Plymouth University is a £2.7 million collaborative project designed to help healthtech businesses grow and improve health and wellbeing, and enhance the quality of care in the region through the development and use of innovative new technology. EPIC helps new and existing healthtech companies in two key ways. For established healthtech businesses with existing ideas or solutions, EPIC provides funding and support to help businesses develop and refine those solutions, and bring them to market in Cornwall and beyond. For startups at the beginning of their journey, EPIC consults patients and relevant user groups to delve into the real healthcare issues and needs in the region – ensuring that whatever startups create, they’re both successful and beneficial to the local population. For healthtech innovators arriving in Cornwall from the Nordics, EPIC can be a valuable source of both critical funding, and deep local understanding of the healthcare environment in Cornwall. This proven approach of simultaneously ensuring that heathtech solutions are both as strong as they can be technically, and best positioned to meet today’s real demands has already led to significant successes for new and existing companies alike since EPIC was established in 2017. Across Cornwall you’ll find a major focus on solving practical problems and demonstrating the real-world value of healthcare innovations and advances. Even the region’s academic institutions are starting to put a greater amount of focus on the practical applications of their research. That push towards practical, collaborative innovation is also reflected in many of Cornwall’s incubators and workspaces. By creating spaces that encourage collaboration, natural clusters of healthtech innovators are appearing, fuelling ideas sharing and greater outcomes for everyone involved. Kernow Health CIC supports and enables a practical approach to healthtech innovation in Cornwall through its sandbox offering. The sandbox gives companies access to GPs and patients at scale to conduct practical tests of their services and tools. That gives the companies practical evidence of what their solutions can help the NHS achieve – a vital asset for selling finished products into any NHS trust. 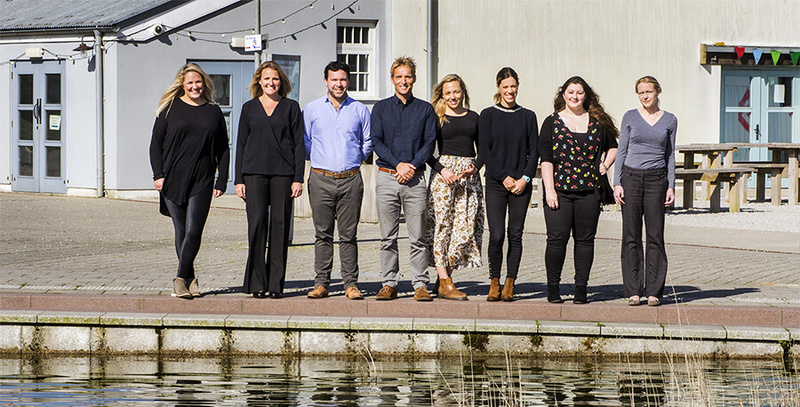 The streamlined healthcare environment in Cornwall, and the support available to help new companies enter it were both hugely appealing factors when Swedish Healthtech company Strikersoft was looking to move into the UK. After initially engaging with Cornwall Trade and Investment at an event in Sweden, the company worked with Cornwall Trade and Investment to set up a valuable visit to the region – filled with productive meetings with people who would prove to be invaluable connections once the company planted its flag in Cornwall. These meetings sparked ongoing conversations that helped Strikersoft sell its solutions into Cornwall’s sole NHS trust. Now, with that success under their belt, the company is looking further into the UK, identifying new trusts that could also benefit greatly from the innovation healthtech software it provides. You can read Strikersoft’s full story, and see how Cornwall Trade and Investment can support you along a similar journey to healthcare tech success here. 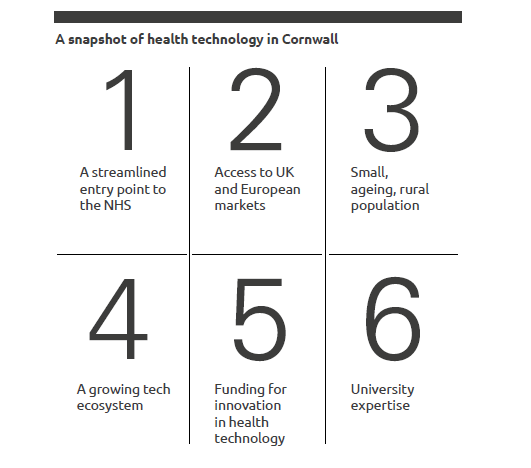 Get the Cornwall – A gateway to the UK and beyond for Nordic Healthcare Innovators booklet. To find out more contact the Cornwall Trade and Investment team.